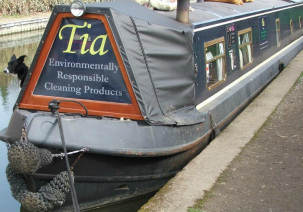 We operate from our narrowboat "Tia" selling Environmentally Responsible Cleaning Products, (such as washing up liquid, all-purpose cleaners and polishes) and refills on the canals around the south Midlands. The products we sell are all phosphate-free and kinder to the living environment in which we operate and live. 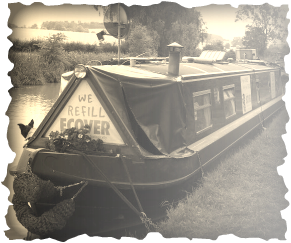 They are also very effective cleaning tools and we test each one prior to selling it to make sure it works and "does what it says on the tin"
Tia is a British Waterways Registered Trader and is a member of The Roving Canal Traders Asscociation. Please take a look at our Products and Prices Page for a full inventory of what we sell. The Where Are We Page will inform you of our current location and our Diary Of Events Page will contain information about shows and festivals we are attending.